There’s never a dull moment when it comes to Black women and our hair. Yesterday (Sept 15), two women filed a class action lawsuit against L’Oreal USA, accusing the beauty brand of leaving them with “burning on their scalp and developed bald spots” after using Softsheen-Carson’s Optimum Amla Legend Relaxer. For some context, I recall getting one or two relaxers as a child and the memories are not pleasant. Although my hair was everything I thought it should be—long, smooth and straight— getting to that point was painful. It was assumed that if you didn’t wait to feel that burning sensation on your scalp, it wasn’t working. So, the longer you wait, the better the results. Looking back, I realize how ludicrous the concept is. Don’t get it twisted; I’m not completely against relaxers. Not everyone is about the natural life and that’s OK. In fact, that’s what makes black hair so magical; our textures exist on an incredibly wide spectrum. Although the brand claims to offer “the safest and most effective” beauty products, this relaxer is particularly trusted because of the star ingredient. Derived from the Indian gooseberry tree, amla oil is created by drying out an amla fruit and soaking it in natural oils for a few days. Beyond its holistic uses within Indian culture, the botanical ingredient is renowned for its many hair uses: deep conditioning, dandruff prevention and ironically—hair growth. What baffles me about this entire case is how it was assumed that this miracle oil would somehow cancel out all of the harmful ingredients commonly used in perms and relaxers. Well, of course that’s what you’re getting. Look on the box of any relaxer and you’re bound to see commonly used ingredients like sodium hydroxide and phosphoric acid. They’re also used in household cleaning products; this is why you need gloves when applying to your hair. 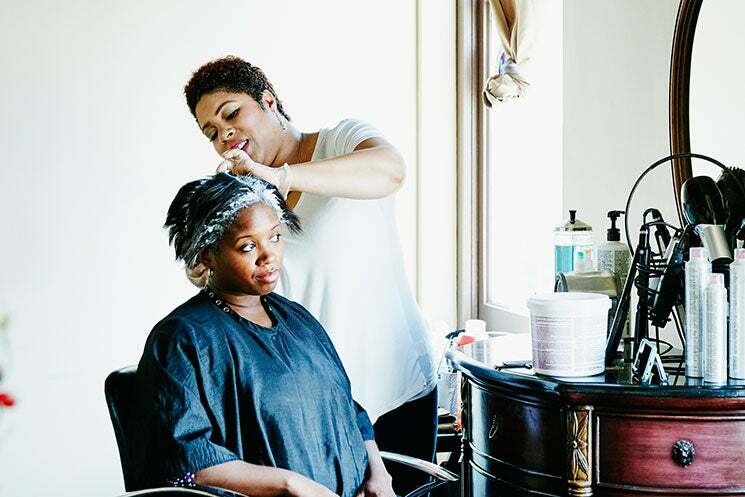 In an effort to make sure that I wasn’t thinking too hard about this, I reached out to Diane Bailey, celebrity natural hair stylist and SheaMoisture Brand Ambassador, for her thoughts. And although we assume this is just part of the routine, it is unacceptable. Regardless of how long the tradition has existed within our community, there is no “perfect golden elixir” for smooth strands; it comes with consequences. I have no idea how this lawsuit will pan out (L’Oreal has yet to issue a statement), but the proof is in the pudding…or cream. Although the damage caused by this product appears to be a little more extreme, you should always tread lightly when chemically processing your hair. No matter how many healthy ingredients you add to the mix, there’s also the risk of permanent damage.